Cases decided by the Supreme Courts (US and California) that will affect your public entity as well as those that are pending at the end of the year. Update on impact of Janus vs. AFSCME on labor negotiations, personnel practices, and communications with employees and union officials, including updated communication plans for the anticipated trends in 2019. New this year: Critical developments from the federal agencies: Departments of Education, Labor, Justice, Homeland Security. Overview and analysis of all the new guidance publications and regulations from federal and state enforcement agencies, including OSHA, EEOC, DFEH and DOL wage and hour division. New this year: Complete update on key principles involving workplace safety, including violence prevention, drug and alcohol testing, and more. New this year: Update on newest trends with privacy initiatives, including medical privacy and recordkeeping, wellness initiatives, and related programs. Process, process and more process requirements under federal and state law with documentation techniques to make your job easier. Cyber liabilities: electronic communications, social media, network security and expanded case law from 2018 and anticipated 2019 trends. 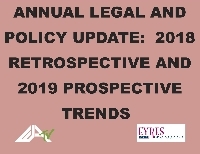 Policy Particulars: New and updated policies you must put in place for 2019. Other new developments and trends in labor, employment and education law.